From flying air mail and testing aircraft, to commanding a major Air Training Command installation which provides trained Air Force technicians to units throughout the world, these are but a few of the many assignments held by the present commander of Lowry Air Force Base -- Major General Charles H. Anderson. Born in Cape Giradeau, Missouri, in 1907, General Anderson, at a very early age, looked to the skies. Upon graduation from the U.S. Military Academy, where he was commissioned a second lieutenant, General Anderson attended and graduated from Advanced Flying School in October 1933.
years that followed; he was detailed as operations and training officer for the Philippine Army Air Corps. base executive officer, a position he held until 1942 when he became commanding officer of the field. In 1944, General Anderson was once again reassigned overseas, this time to the China-Burma-India Theatre, where he acted as chief of staff of an Air Task Force in support of the British 14th Army. of 1949, he was selected to attend the National War College at Washington, D.C. where he graduated in June of the following year. General Anderson reported for duty at Air Force Headquarters in June 1950 to serve in the Office of the Deputy Chief of Staff, Personnel. In August 1951 he was transferred to the Office of the Assistant Secretary of Defense (Manpower and Personnel), where he served as director of Military Personnel Policy Division until August 1953 when he was named director of manpower requirements in the Office of the Assistant Secretary of Defense (Manpower and Personnel). A third overseas tour of duty was forecasted for General Anderson, when in August of 1955, he became director of operations in the Office of the Air Deputy, Supreme Headquarters, Allied Powers in Europe. Returned to Washington three years later, General Anderson was assigned as assistant for atomic energy with the deputy chief of staff operations, Headquarters, U.S. Air Force, where he remained until his assignment to Lowry, Aug. 15, 1960, as commander of Lowry Technical Training Center. 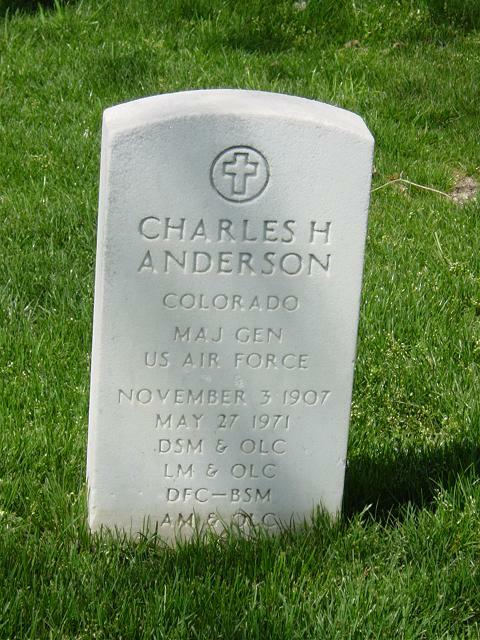 Genreal Anderson was buried with full military honors in Section 34, Arlington National Cemetery.